Datastage developers or ETL developers are accountable for technology designing, building, testing and deployment of various tools and technologies. 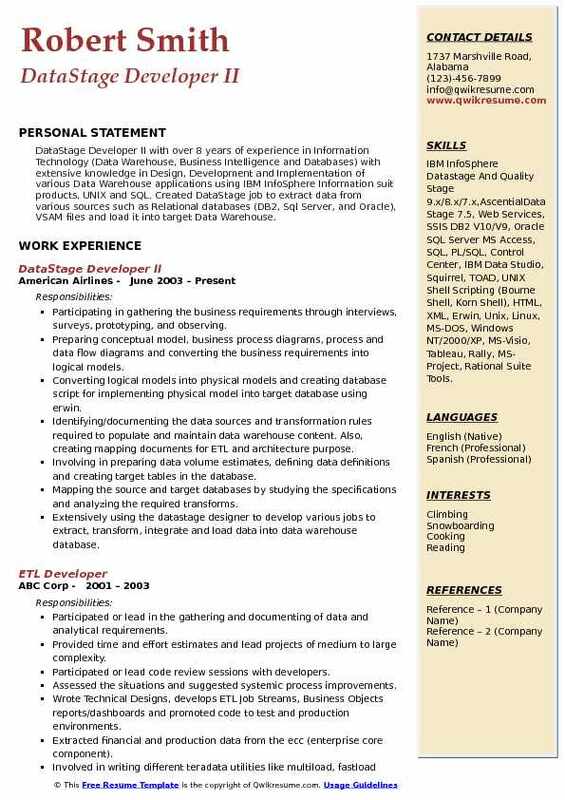 Some of the best Datastage Developer Resume indicate the following job duties for these professionals – providing technical assistance, developing and implementing tests, monitoring all Datastage jobs, designing and analyzing ETL job editions, managing and applying various performing techniques, analyzing work and implementing business regulations, scheduling and planning Datastage works, preparing various computer software designs, conducting tests on SDLC and documenting all program level processes. The most skillful Datastage developer professional should indicate capability to manage ETL, have familiarity in Datastage or Informatica, web intelligence, SAP business objects, and Xcelsius. Employers prefer candidates who possess ample developer experience in Datastage development. However, Insofar is considered as the best educational background for this job post. 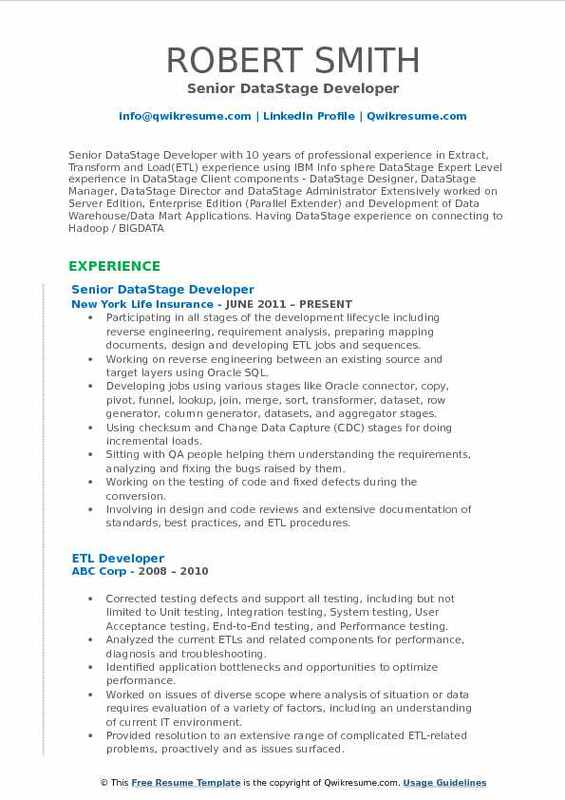 Headline : Sr. DataStage Developer with over 6+ years of ETL and Data Integration technical experience in Finance domain as a developer in System Analysis, Design, Development, Testing and Support of projects using Datastage in Banking, Retail and Insurance and Automobile verticals. 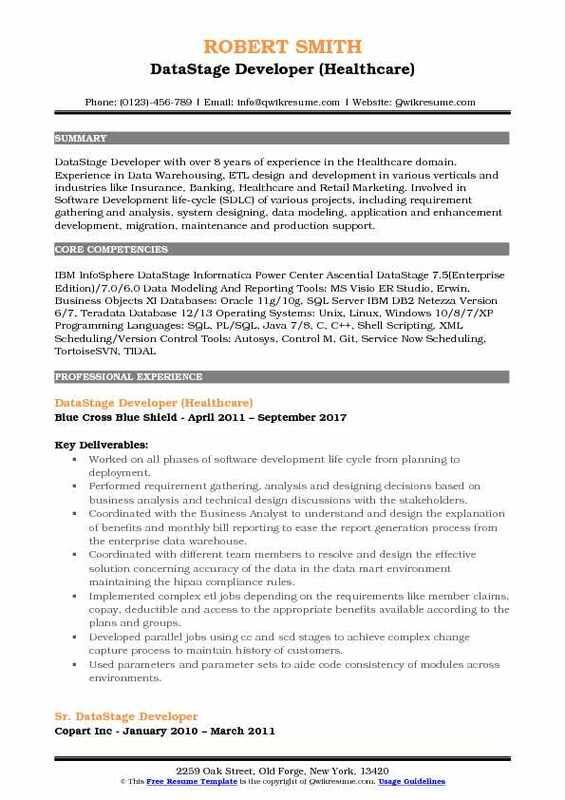 Experience in Software Development Life Cycle requirement gathering, client interaction. Experience in reading and loading high-volume Type 2 dimensions by implementing SCD (Slowly Changing Dimensions). Loading of all sales data from various sources into the database. Actively participating in decision making and QA meetings and regularly interacting with the Business Analysts and development team to gain a better understanding of the business process, requirements & design. Using DataStage as an ETL tool to extract data from sources systems, loaded the data into the IBM DB2. Creating jobs to read and write data into complex flat files, Cobol files, sequential files. Designing and developing a data stage jobs to extract data from heterogeneous sources applied to transform logic. Creating Datastage 8.5 jobs using different stages like the transformer, aggregator, sort, join, merge, lookup, data set, funnel, remove duplicates, copy, modify, filter, change data capture, change apply, column. Extensively using the Datastage for extracting, transforming and loading databases from sources including flat files. 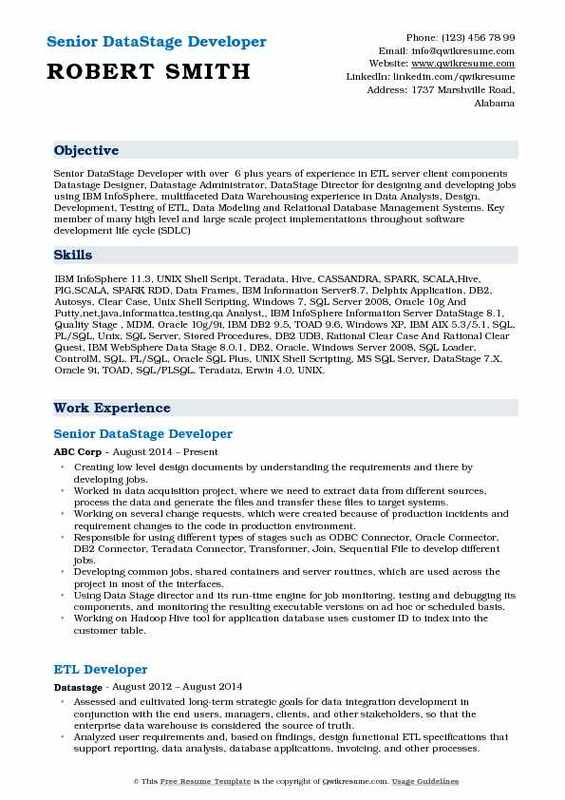 Objective : Junior DataStage Developer with 3 years of experience in using ETL tools like IBM InfoSphereDataStage, AscentialDataStage and SSIS. Took part in different aspect of a systems development life cycle of different projects including Requirement Gathering, Data Modeling, Development, Production support, Maintenance and Performance tuning. Extensively worked on using Datastage Client components like Datastage Designer Administrator, Director and Manager in Data Warehouse ETL development. Working with Business Analyst to identify, develop business requirements, transforming it into technical requirements and responsible for deliverables. Implementing join, lookup, aggregates, filters, rank and update strategy transformations. Working towards optimal performance when using stages like lookup, join, and merge. Extensively working with Datastage Designer and Director to load data from source extract files to the warehouse. 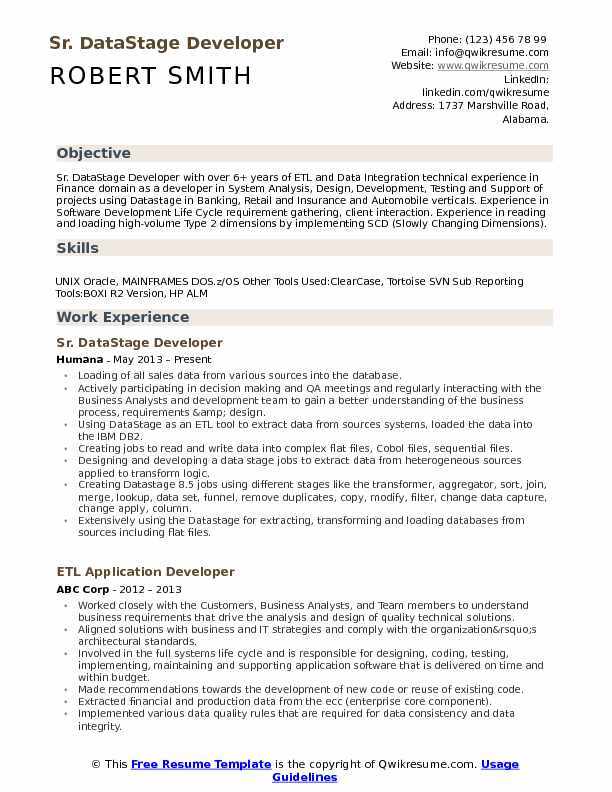 Providing the staging solutions for data validation and cleansing with PL/SQL and Datastage ETL jobs. 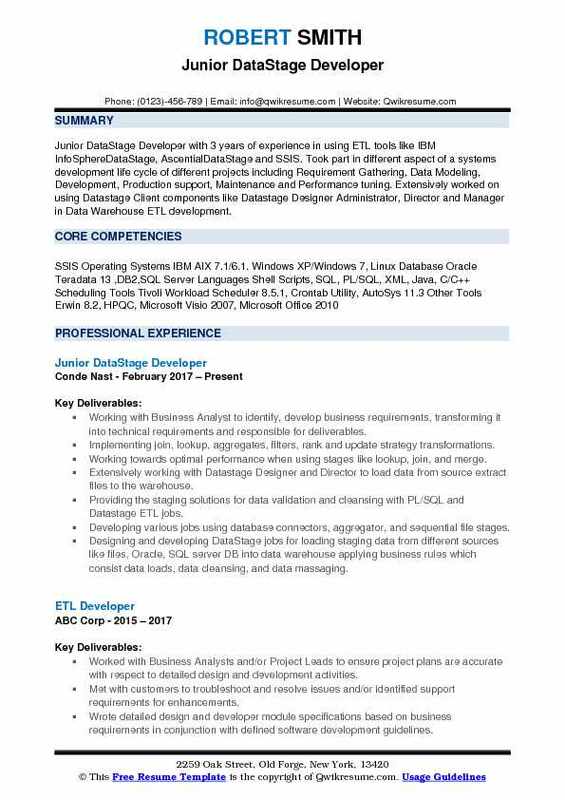 Developing various jobs using database connectors, aggregator, and sequential file stages. Designing and developing DataStage jobs for loading staging data from different sources like files, Oracle, SQL server DB into data warehouse applying business rules which consist data loads, data cleansing, and data massaging. Creating a shared container to simplify the DataStage design, and used it as a common job component throughout the project. Tuning DataStage jobs for better performance by creating DataStage lookup files for staging the data and lookups. Involved with application and database support teams to maintain system and database which supports current data scenarios and easily adapts to changing business needs. Used parallel extender extensively by using processing, development/debug, file and real-time stages. Involved in all phases including requirement analysis, design, coding, testing, support, and documentation. Extensively used DataStage designer to develop processes for extracting, transforming, integrating and loading data from various sources into the data warehouse database. Extensively used quality stage stages like standardize, match frequency, duplicate & unduplicated match and survive stages. Widely used different types of DataStage stages like modify, sequential file, copy, aggregator, surrogate key, transformer, dataset, look up, join, remove duplicates, cff, sorter, column generators, cdc, and funnel. Used database stage like db2/udb enterprise, db2 bulk load, Drs, Sybase, odbc connector. Designed and developed the process for real-time data movement of reference data from Sybase to db2 using a mix of DataStage jobs. Developed information service stages (wisd) for real-time data movement between db2 and Sybase. Involved in generating an SOA service of DataStage quality stage job and deploy/manage the services using IBM console to receive service requests. Worked with data modelers, technical architects, customer/end user, business analysts, and data analysts to design technical specification documents/mapping documents. Participating in all stages of the development lifecycle including reverse engineering, requirement analysis, preparing mapping documents, design and developing ETL jobs and sequences. Working on reverse engineering between an existing source and target layers using Oracle SQL. Developing jobs using various stages like Oracle connector, copy, pivot, funnel, lookup, join, merge, sort, transformer, dataset, row generator, column generator, datasets, and aggregator stages. Using checksum and Change Data Capture (CDC) stages for doing incremental loads. Sitting with QA people helping them understanding the requirements, analyzing and fixing the bugs raised by them. Working on the testing of code and fixed defects during the conversion. Involving in design and code reviews and extensive documentation of standards, best practices, and ETL procedures. Taking the responsibility of code back up and checking it in TFS and maintain the versions of the code changes. Responsible for adopting the company standards for stage & link naming conventions. 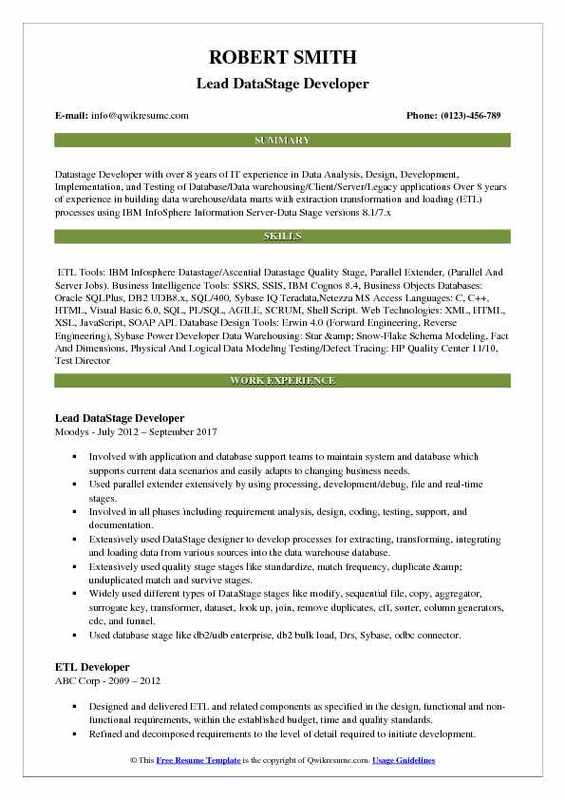 Headline : ETL/Datastage Developer with over all 6 years of experience in Healthcare domain implementing Full Life Cycle (SDLC) for Data Warehousing projects, includes Business requirements gathering, Analysis, Design, Development, Implementation, Deployment and Maintenance of ETL (DataStage) and Business Intelligence applications (BO Reporting). In-depth experience in Extraction Transformation and Loading (ETL) processes using IBM WebSphere Data Stage (Parallel Extender). Working closely with the data modeler and database administrator to understand the business processes and participated in the analysis of business requirements to build the data warehouse model. Extensively using DataStage designer to develop the parallel jobs and server jobs. Designing several DataStage jobs using join, merge, lookup, change apply, change capture, funnel, filter, odbc, column generator, transformer, modify, surrogate key, aggregator, dcode, row generator and XML stages. Developing parameter-driven ETL processes to map source systems to target data systems with DataStage complete source system profiling. Implementing various partition methods like hash, entire, auto, and Oracle. Developing complex transformations, surrogate keys, dimension tables, and fact tables. Utilizing the environment variables and stage variables for developing parameter-driven jobs and debugging them. Identifying the facts and dimensions for developing a logical design of the data marts. Extracting and transforming the source data from Oracle database and XML sources to load into the data warehouse in Oracle and Teradata. Performing data extractions and loads using Teradata database utilities like multiload, fast load and fast export for large warehouse and for datamarts in Teradata. Skills : IBM InfoSphere 11.3, UNIX Shell Script, Teradata, Hive, CASSANDRA, SPARK, SCALA,Hive, PIG,SCALA, SPARK RDD, Data Frames, IBM Information Server8.7, Delphix Application, DB2, Autosys, Clear Case, Unix Shell Scripting, Windows 7, SQL Server 2008, Oracle 10g And Putty,net,java,informatica,testing,qa Analyst,, IBM InfoSphere Information Server DataStage 8.1, Quality Stage , MDM, Oracle 10g/9i, IBM DB2 9.5, TOAD 9.6, Windows XP, IBM AIX 5.3/5.1, SQL, PL/SQL, Unix, SQL Server, Stored Procedures, DB2 UDB, Rational Clear Case And Rational Clear Quest, IBM WebSphere Data Stage 8.0.1, DB2, Oracle, Windows Server 2008, SQL Loader, ControlM, SQL, PL/SQL, Oracle SQL Plus, UNIX Shell Scripting, MS SQL Server, DataStage 7.X, Oracle 9i, TOAD, SQL/PLSQL, Teradata, Erwin 4.0, UNIX. Creating low level design documents by understanding the requirements and there by developing jobs. Worked in data acquisition project, where we need to extract data from different sources, process the data and generate the files and transfer these files to target systems. Working on several change requests, which were created because of production incidents and requirement changes to the code in production environment. Responsible for using different types of stages such as ODBC Connector, Oracle Connector, DB2 Connector, Teradata Connector, Transformer, Join, Sequential File to develop different jobs. Developing common jobs, shared containers and server routines, which are used across the project in most of the interfaces. Using Data Stage director and its run-time engine for job monitoring, testing and debugging its components, and monitoring the resulting executable versions on ad hoc or scheduled basis. Working on Hadoop Hive tool for application database uses customer ID to index into the customer table. Converting the complex job designs to different job segments and executed through job sequencer for better performance and easy maintenance. Using the Datastage as an ETL tool to extract data from sources systems, loaded the data into the IBM DB2 database. Skills : IBM Infosphere DataStage 8.7/8/5, IBM Websphere DataStage 8.0.1 (Designer, Director, Administrator), Ascential DataStage 7.5.2 (Designer, Director, Administrator, Manager), Ascential DataStage 7.0/6.0. Data Modeling MS Visio Diagram, IBM Rational Rose, ERwin R8.1. Databases SQL Server IBM DB2/UDB, Teradata, Oracle 10g/9i/8i Tools SQL Server Management Studio, Win SQL, IBM DB2 Control Center, SQLLoader, TOAD. Operating System IBM AIX 5.2/4.x, Linux, Windows Languages SQL, PL/SQL, Unix Shell Scripting, Java, HTML, XML. Gathering all the information from existing ETL team and source providers. Participating in business meetings and understanding the current job flow and their dependencies. Working closely with the source system owners in getting the source files, and discussing the data related issues. 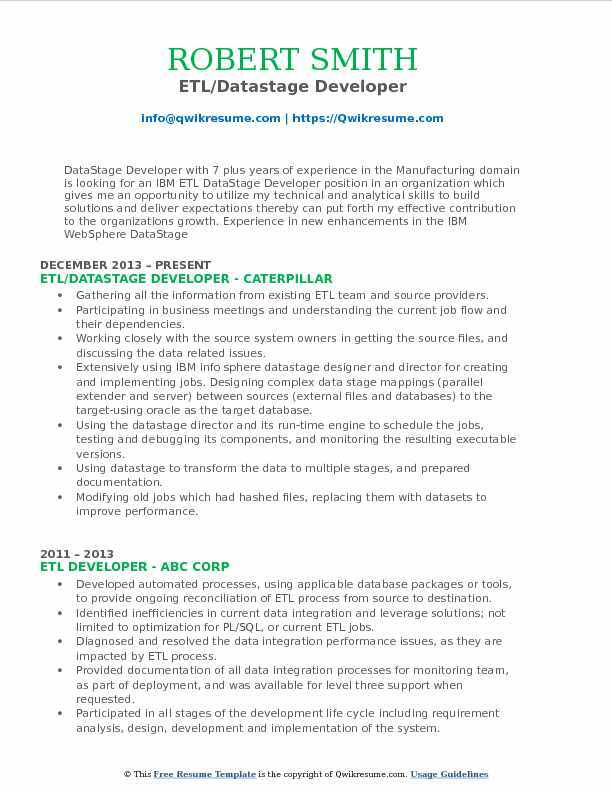 Extensively using IBM info sphere datastage designer and director for creating and implementing jobs. Designing complex data stage mappings (parallel extender and server) between sources (external files and databases) to the target-using oracle as the target database. Using the datastage director and its run-time engine to schedule the jobs, testing and debugging its components, and monitoring the resulting executable versions. Using datastage to transform the data to multiple stages, and prepared documentation. Modifying old jobs which had hashed files, replacing them with datasets to improve performance. Working with multiple sources which included ingres, oracle, flat files, teradata, sybase. Changing slow performing jobs to high efficient jobs by analyzing and making necessary manipulations. 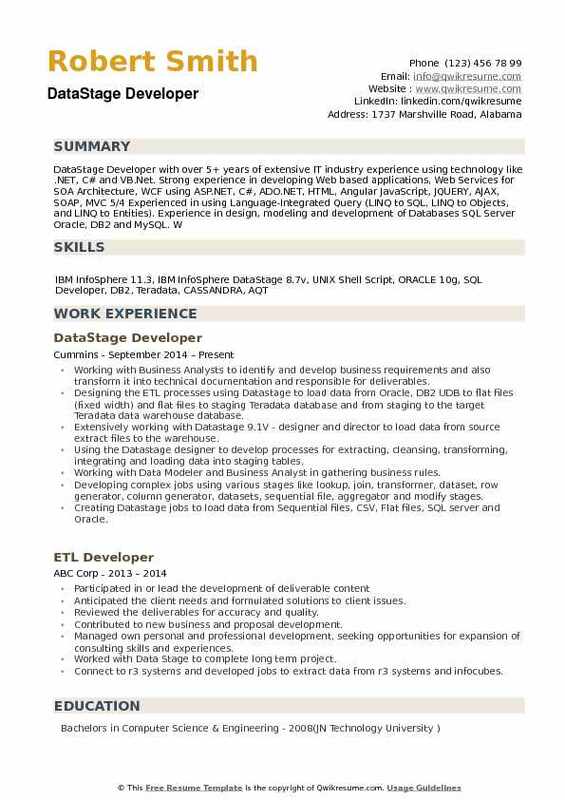 Summary : DataStage Developer with over 8 years of experience in the Healthcare domain. Experience in Data Warehousing, ETL design and development in various verticals and industries like Insurance, Banking, Healthcare and Retail Marketing. Involved in Software Development life-cycle (SDLC) of various projects, including requirement gathering and analysis, system designing, data modeling, application and enhancement development, migration, maintenance and production support. Worked on all phases of software development life cycle from planning to deployment. Performed requirement gathering, analysis and designing decisions based on business analysis and technical design discussions with the stakeholders. Coordinated with the Business Analyst to understand and design the explanation of benefits and monthly bill reporting to ease the report generation process from the enterprise data warehouse. Coordinated with different team members to resolve and design the effective solution concerning accuracy of the data in the data mart environment maintaining the hipaa compliance rules. Implemented complex etl jobs depending on the requirements like member claims, copay, deductible and access to the appropriate benefits available according to the plans and groups. Developed parallel jobs using cc and scd stages to achieve complex change capture process to maintain history of customers. Used parameters and parameter sets to aide code consistency of modules across environments. Prepared and performed unit test cases to validate the data generated. Extensively used sql queries for retrieving and processing data in databases and datastage. Performed code reviews to validate the deliverables like ETL code, design documents, test cases. Developed Unix shell scripts for scheduling, supplying parameter values and performing business requirements, ftp and audit activities. 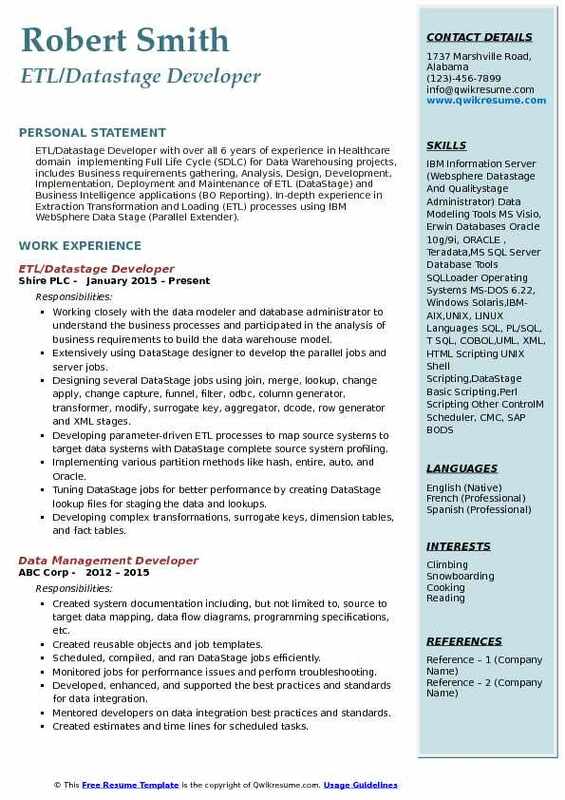 Summary : DataStage Developer II with over 8 years of experience in Information Technology (Data Warehouse, Business Intelligence and Databases) with extensive knowledge in Design, Development and Implementation of various Data Warehouse applications using IBM InfoSphere Information suit products, UNIX and SQL. Created DataStage job to extract data from various sources such as Relational databases (DB2, Sql Server, and Oracle), VSAM files and load it into target Data Warehouse. Skills : IBM InfoSphere Datastage And Quality Stage 9.x/8.x/7.x,AscentialDataStage 7.5, Web Services, SSIS DB2 V10/V9, Oracle SQL Server MS Access, SQL, PL/SQL, Control Center, IBM Data Studio, Squirrel, TOAD, UNIX Shell Scripting (Bourne Shell, Korn Shell), HTML, XML, Erwin, Unix, Linux, MS-DOS, Windows NT/2000/XP, MS-Visio, Tableau, Rally, MS-Project, Rational Suite Tools. Participating in gathering the business requirements through interviews, surveys, prototyping, and observing. Preparing conceptual model, business process diagrams, process and data flow diagrams and converting the business requirements into logical models. Converting logical models into physical models and creating database script for implementing physical model into target database using erwin. Identifying/documenting the data sources and transformation rules required to populate and maintain data warehouse content. Also, creating mapping documents for ETL and architecture purpose. Involving in preparing data volume estimates, defining data definitions and creating target tables in the database. Mapping the source and target databases by studying the specifications and analyzing the required transforms. Extensively using the datastage designer to develop various jobs to extract, transform, integrate and load data into data warehouse database. Designing and developing Change Data Capture (CDC) process to extract delta data from ODs. Designing datastage parallel jobs involving complex business logic, update strategies, transformations, filters, lookups and necessary source-to-target data mappings to load the target. Extensively working on job sequences to control the execution of the job flow using various activities & triggers (conditional and unconditional) like job activity, wait for file, email notification, sequencer, exception handler activity, routines (threshold) and execute command activity. Extensively using the sequential file, modify, dataset, filter, funnel, join, lookup, copy, aggregator, transformer, remove duplicate and sort during etl development. Working with Business Analysts to identify and develop business requirements and also transform it into technical documentation and responsible for deliverables. Designing the ETL processes using Datastage to load data from Oracle, DB2 UDB to flat files (fixed width) and flat files to staging Teradata database and from staging to the target Teradata data warehouse database. Extensively working with Datastage 9.1V - designer and director to load data from source extract files to the warehouse. Using the Datastage designer to develop processes for extracting, cleansing, transforming, integrating and loading data into staging tables. Working with Data Modeler and Business Analyst in gathering business rules. Developing complex jobs using various stages like lookup, join, transformer, dataset, row generator, column generator, datasets, sequential file, aggregator and modify stages. Creating Datastage jobs to load data from Sequential files, CSV, Flat files, SQL server and Oracle. Developing various jobs using ORA OCI, ODBC, Aggregator, Sequential File Stages.